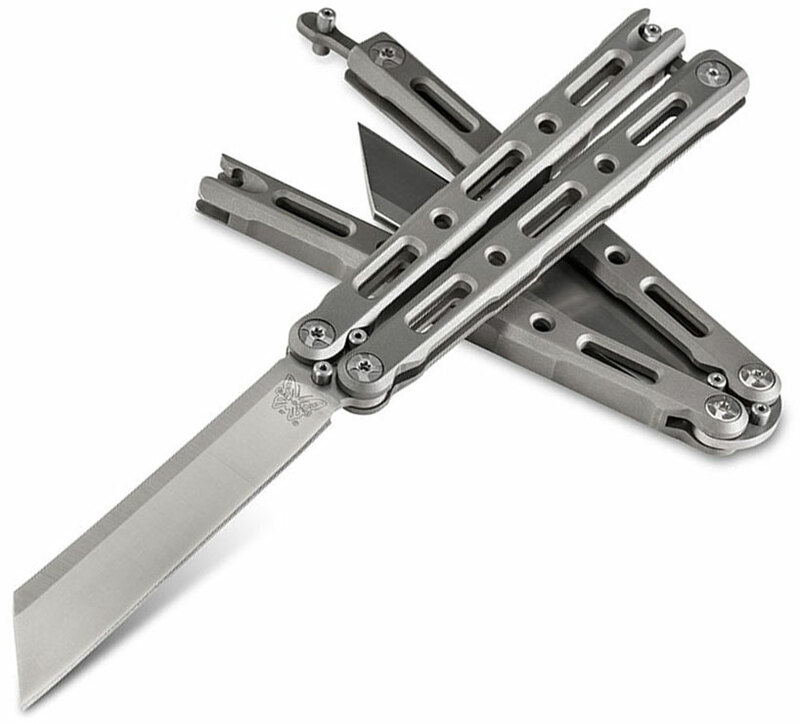 The past inspires the future, and while it all started in 1987, nothing about this billet titanium Balisong is old school. 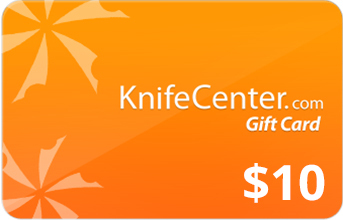 This model features a 4.5" sheepsfoot blade made from premium CPM-S30V stainless steel. The handle is made from a single piece of billet titanium and then sandblasted for a gorgeous finish. I will start off with saying that this Balisong has turned into the knife I love the most. My collection of blades is a decent size with the bulk of my blades being folding knives; Spyderco and Cold Steel mainly. A few years ago I was turned onto Balisong's by a friend who gifted me a Pacific Cutlery Model 68. Little did I know.....I had no idea how to flip/open these style of knives and a year or so went by before curiosity got the better of me. My jaw dropped on the floor when I discovered what I was given, I always suspected it was a Benchmade product due to the butterfly logo, but the "Balisong" was unfamiliar to me. I still can not believe that after twenty plus years of owning and collecting folder's, loving the steel, learning how to sharpen a blade to a razor's edge, cleaning, caring for them, and I never handled a butterfly knife. Now I am hooked.Just a little more back story (it is important) and then I will delve into my impression of the BM87. 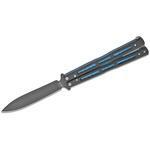 Butterfly knives just scared me I suppose. The thought of twirling a razor blade in my hands seemed like a bad idea, especially given the fact that ALL of my knives are sharper than average. Anyone reading this most likely falls into the same category, otherwise you have no reason to be purchasing a $500 knife. YouTube videos taught me how to properly open a balisong. The Pacific Cutlery I started with is a great blade, but is only 3.1" in length, sports a utility style balde, stainless handles and the pivot pins are flush. It does not deserve to be used as an EDC which is why I started looking to replace it. In the meantime, research led me to purchase a Squiddy trainer. Love it too. With that confidence, I wanted a Balisong to carry as an EDC. I put the BM87 on layaway. At the same time I managed to get it on a BRS Barebones Tanto V2. After the short handled PC 68, and the light weight Squiddy, the BRS was a real contender. It is smooth and balanced. Overall the best Balisong I own, until now.The Benchmade 87 took three months of payments and arrived just after the new year. Those three months saw me carrying the Squiddy for practice, the BRS to use as my EDC, and a Spyderco Tenacious. Mind you that those three blades, plus a SOG multiplier tool were on me at all times. That is a lot of weight on my belt and in my pockets. I could not really see using the BRS for EDC, the blade is scrawny and the tip is fragile. One drop or wrong twist while cutting is not going to do it any favors to say the least. To top it off, the up-swept profile of the tanto tip actually stabbed me no less than three times on the back of my middle finger, into the knuckle on the base of the finger. I rarely cut myself, even while learning to flip bali's, minor light cuts of course happen, but that BRS has drawn the most blood. The day the 87 arrived, I was so excited. Watching video reviews, reading every review I could find, had built it up and it was finally here. The finish is awesome. 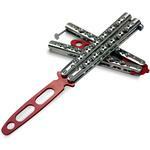 The bead-blasted surface offers so much grip compared to the other three butterfly knives I described above. The handle length is just right for a secure grip while performing any cutting task. The magnetic latch pops out of the detent with a simple squeeze and remains in line with the bite handle. I never secure it in the open position, but rest assured, it is tight and makes the knife feel like a fixed blade. The lack of blade play contributes to this as well. Flipping the 87 is a dream. It is so smooth. There is a difference in how the knife feels compared to the bronze-phosphor washers used in other systems. I do keep a small container of Rem Oil in my sharpening kit (along with a full range of torx drivers) to maintain the 87. I am not afraid to get the blade wet and I do wash the knife to keep the channels of the handles clean, as well as the blade. Just make sure to dry it and oil it properly on a regular basis, no different than any other knife. I can pretty much do all of the basic beginner moves falling short of behind the 8-ball. The move that made the BRS Barebones Tanto stab me was going from an ice-pick back to a normal hold. The 87 does not come anywhere near close to my finger.The steel of the 87 is razor sharp. I have EDC'd CPM-S30V for about three years in the form of a Spyderco Native, so I am very familiar with the characteristics and the 87 is consistent with that. The edge remains sharp and requires less maintenance overall. The blade profile is conducive to daily cutting tasks, which for me has always been boxes and tape. Then whatever else happens to come along, be it clothing material, leather, and first aid. I carry the multi-tool for more intense tasks. The right tool for the right job. The 87 easily pops the hair off my arms, it is so hard to get rid of that mange...I recommend Spyderco's Sharpmaker kit to maintain the edge. My kit is over 20 years old and is still going strong.The last item regarding the 87 is the sheath. Just about all the reviews are negative. I disagree. 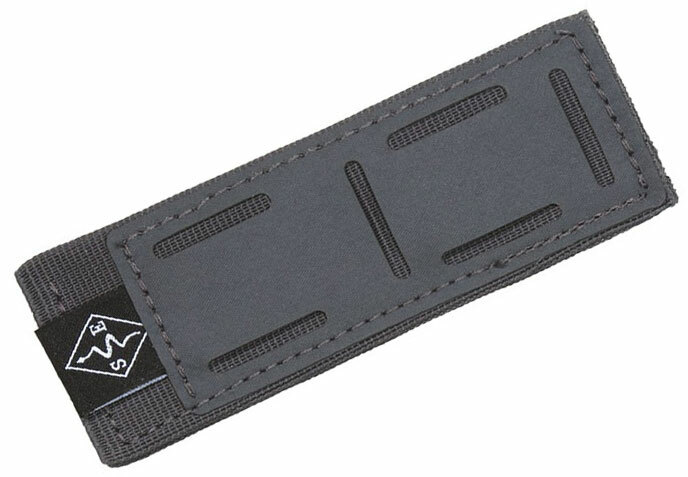 The material is soft, holds the knife securely on my belt in a vertical position, and I never have worried about the blade coming out due to body position or sitting down and having a chair push it out. Between the bead blast finish and the texture of the cloth, it really does hold it well. The Velcro for the belt loop works just fine. It has not changed position or loosened up since I set it at day one. I do not expect it to. Not only that, the sheath is light weight and protects the finish of those all too important, forged, milled, titanium handles. Over the years I have worn various materials for sheaths/holsters with leather being preferred and this synthetic material made me raise an eye brow. I like it.Overall, is this 87 worth the price? I believe so. I no longer carry two balisongs plus a folder for the actual cutting tasks. I was scared to use the BRS because it appears fragile. The 87 outperforms the Barebones, and it should, considering the price. I feel confident when opening the knife. It is smooth, precise, predictable and sharp. I do not throw the blade in the air or do any advanced moves. But the basic openings I have learned so far can be performed with a speed that makes others cringe. 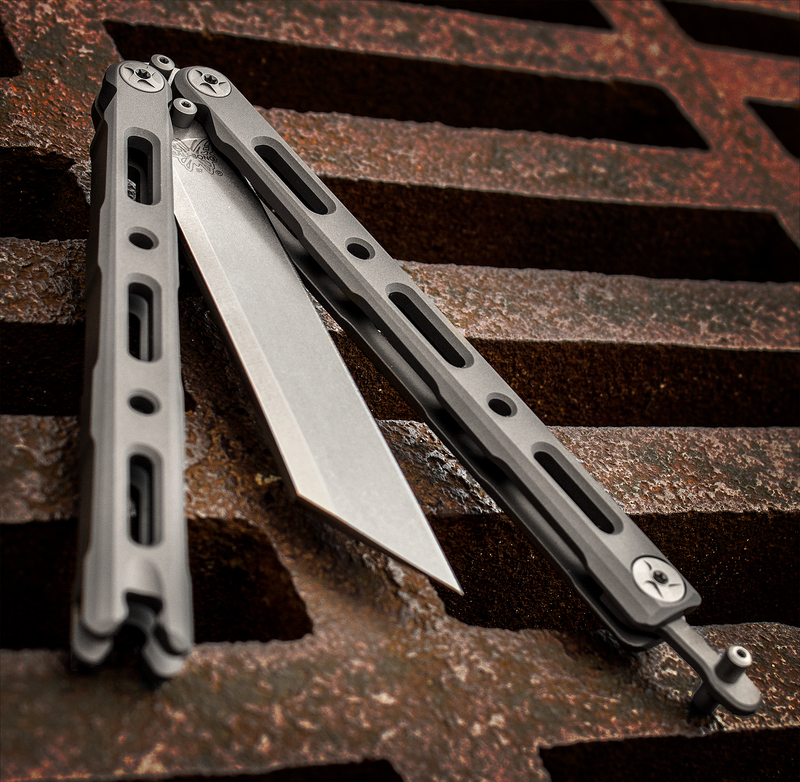 The Benchmade 87 is a wonderful piece of modern machining with high-tech materials all rolled up into a package that is the epitome of art and function. That being said, out of a collection of over 15 blades, each one of them a quality item, the 87 accounts for only one of two Benchmade products. I also have peace of mind knowing that Benchmade will be there to honor any warranty issues, as well as general maintenance, should the need arise. It is my new every day carry and will reside in my collection for the rest of my life. I hope this helps someone who is on the fence about purchasing one, and thank-you for reading my review. First have to commend knifecenter on fast shipping, was impressed with how quickly I got my order.Important to note - I am not a serious flipper. I dabble but bought this primarily as an EDC. I have long thought balisongs are a highly practical design and enjoy some flipping. Benchmade knives have always been pretty much bulletproof for me so I prefer their knives. I also own a 51.Overall love the design. It is highly polarizing - guys either love it or hate it. I am in the first camp. the machining on the handles is awesome, and the bead blast finish looks good. It picks up scratches easily, but I don’t really find this to be a bad thing. It doesnt take away from the appearance. 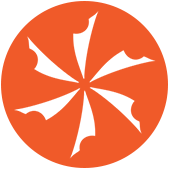 Wharnecliffe blade comes razor sharp. I absolutely mean razor sharp - it easily took hair off my forearm. I heard some guys experienced blade rub on an early run but this has not been an issue for me. Knife came tuned properly and I have had no issues with any screws backing out - expected, due to Benchmade purportedly using Red Loctite on all screws and zen pins. This is both good and bad... nothing will ever back out but good luck ever dissasembling your knife for cleaning/maint. Very little to no blade play.The magnetic lock works well, but binds slightly depending on the position of your hand and how hard you bring the handles together to release it. A little practice solves this.Thrust bearings provide super smooth opening/closing. Definitely a fan, with one concern, cleaning. If they ever rust, that could create and issue too - so that super smooth action comes at a potential cost if you fail at proper maintenance.A lot of people made a huge deal out of the sheath, and I will admit - I dont get why. It’s not great, and it’s not terrible. It does what it is supposed to do. 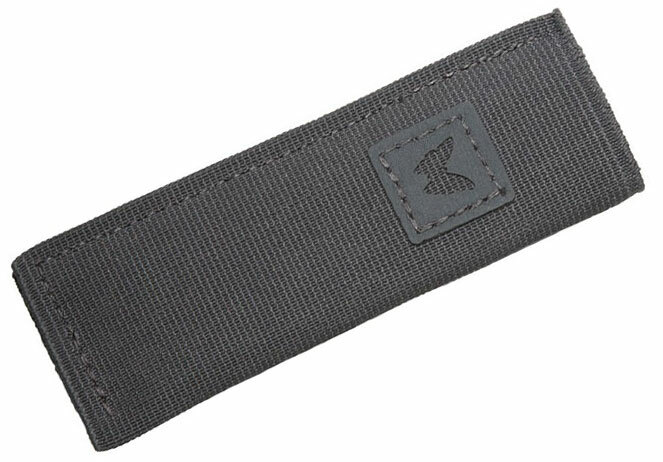 Reminds me very much of a BFG 10 speed pouch.Overall very happy with this knife. If it suits your needs and you have the funds, I recommend it. 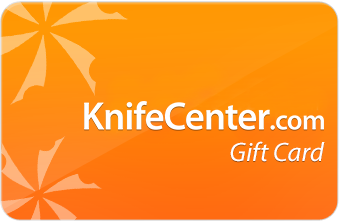 Hey, I wanted to share "Benchmade 87 Ti Balisong Butterfly 4.5 inch CPM-S30V Wharncliffe Blade, Titanium Handles, Magnetic Latch" with you from KnifeCenter.